The “burning of books and burying of scholars” campaign (213–210 BCE) during the Qin Dynasty of ancient China epitomizes this “war against freedom of thought and speech” that is still raging: all Chronicles except those by the Qin historians, the Classics of Poetry and History, and works of different schools, should be burned; and anyone discussing these books be executed. More than 460 scholars, or almost 1200 according to another count, were buried alive. Soon the campaign led to revolutions and war resulting to further damages of historical texts: the capital was sacked and burned in 207 BCE destroying also the officially sanctioned works which had been retained in the imperial library. The Edict of Milan on Freedom of Religion, which Constantine the “Great” and “Saint” adopted in 313, was introduced to protect the Christians, but as it turned out it seems it concerned only them! Following Galerius’ initiative, who had adopted similar measures two years before, the emperor aimed at consolidating peace (Pax Romana) within the empire, something that had not been achieved through the persecution of Christians. But he was rather a… mama’s boy (his mother, Helena, was a fanatical Christian). Therefore, instead of imposing the strict implementation of religious freedom, he was anything but impartial: e.g. the ancient gods on his coinage were replaced by Christian symbols, especially the XP monogram, which he had also on his labarum. Thus it was obvious the persecutions would go on; there was just a change of roles: the formerly persecuted were now the persecutors. It was also obvious the new persecutions would be much more brutal and bloody, widespread and long-lasting (lasting for centuries), for the simple reason that the Christian leaders, who found themselves in a dominant position, confronted the vast majority of the empire’s subjects who remained faithful to their traditional gods. Besides, it was even more ironic that the persecutions were further multiplied because, as soon as the Christian priesthood was legalized, infighting broke out! As early as 313, the year of the edict, until 317, bishops threw brickbats against bishops in Carthage until they asked for Constantine’s arbitration. There were three ecclesiastical councils and two trials before one faction (that of Donatus) was judged schismatic, with the result that its property was confiscated and the clergy banished. 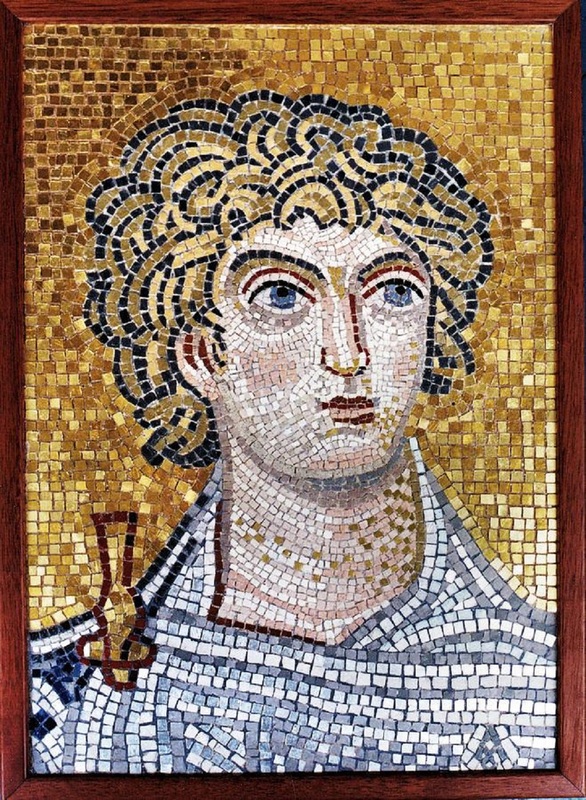 Constantine’s son, Constantius II, proceeded further and constructed a concentration camp in Scythopolis, Palestine, where Hellenes,(a) other gentiles and those who were thought to be “enemies” of the empire, singled out by vile royal counselors, were tortured and killed. Relevant information is given by the Greek gentile historian Ammianus Marcellinus. (a) A Hellene for the early Christian Church was a gentile, a pagan; the word retained that meaning until the end of the millennium. The Greeks distinguished themselves from the others according to cultural standards; the Jews did so according to religious standards. It is more than obvious what the ideals of each people were and what their particular contribution to civilization. In his Epistles, Paul (Saul) uses Hellene almost always juxtaposed to Hebrew, and in disregard of all other ethnicities (Romans, Syrians, Egyptians, etc) living in the area at the time. It is more than obvious who he considered an enemy! Another “softer” interpretation is that a Hellene for him was a polytheist, while a Hebrew was a monotheist. Note that a gentile is first of all a non-Jew (not a non-Christian). 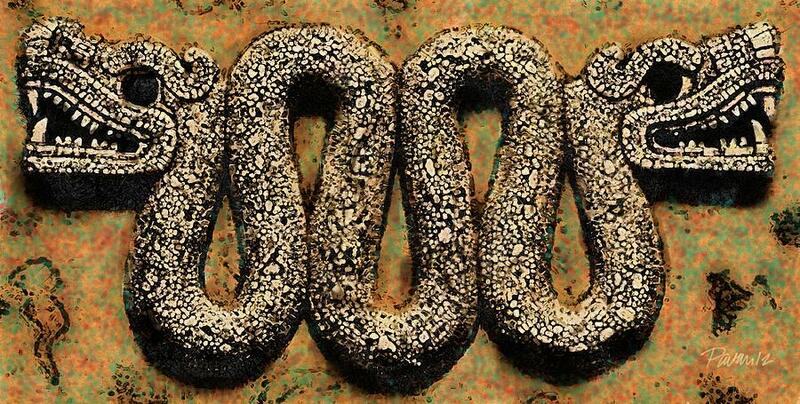 The name Hellene meaning pagan has persisted into modern times. Many persons advocating a revival of the Olympian gods’ worship call themselves Hellenic Polytheists, while the religion is called Hellenismos. Such persons outside of Greece are careful not to imply that they consider themselves Greek nationals. Victory column of Diocletian (it is wrongly referred to as Pompey’s pillar) erected at the Serapeum of Alexandria in 297 CE after suppressing a revolt in Egypt. It’s a granite monolith 20.46 m high, with a total height of 26.85 m.
But who was that “duke of Egypt”, Artemius? According to the Orthodox Church, he was none other than the “martyr” and “saint” Artemius of Antioch, where he was tried and beheaded in 362 for abuse of power and maladministration of his province, having demolished temples and broken down their idols – on his own will or instigated by Georgius. The Church apparently felt that his work was god-blessed… Indeed, it may be that in Julian’s years the “saint martyrs” were two: Artemius and Georgius. Some scholars, you see, such as the English historian Edward Gibbon, identify George of Cappadocia, the bishop, with… George of Lydda, the “saint”! The former was an Arian (i.e. heretic), therefore a “black sheep”. The latter, on the contrary, was the hero of a legend that, in several variations, fascinated even the Muslims. That’s why he should be preserved. The disinformation operation was thus put into motion (keep in mind that what information we have now has passed through… a thousand censoring “sieves”)! George the “saint” was supposedly martyred in 303 during the Diocletianic persecution. The technology of the era, however, did not allow a non-existent person to acquire flesh and bone. That’s why we know nothing about the “saint”, nor is there any proof that he ever existed. Whatever we know is according to… tradition. The oldest text referring to the legend, but without naming George and with no details, is Eusebius’ Church History in the 4th century. The oldest text preserving fragments of the legend is in a Greek hagiography, a palimpsest of the 5th century. His compiler, however, just like Gibbon, also identifies the martyr with his namesake bishop! The Christian emperor Jovian, who was given the “purple” (the crown, as they used to say of later kings) in 363 due to a misunderstanding, reestablished Christianism as the official religion, ending the brief revival of paganism under his predecessor, Julian. Being under the influence of “saint” Athanasius of Alexandria, he moved from tolerance to bigotry “as if by magic”, subjecting those who worshiped ancestral gods to death and ordering the Library of Antioch to be burned down. But he was unable to complete his “mission”: he died (or was killed) half a year later. This task would be undertaken in a while by Theodosius I. The “witch-hunt”, in the meantime, continued with even greater intensity after Julian’s short reign (361-363): Hellenic philosophical and scientific treatises were burned in public, while hundreds of Greeks or other gentiles accused of sorcery were being pilloried, imprisoned, tortured, executed, and their properties were confiscated. Among them was another philosopher, Simonides, who was burned alive. Such accusations of sorcery arose from the practice of theurgy, performed by several Neoplatonic philosophers. It is “man’s conscious participation in the divine work,” which is accomplished by rituals invoking god or gods with the goal of achieving henosis (union with the divine) and perfecting oneself – what the mystics are after so far, e.g. the Sufis, with music and poetry, singing and dancing. Julian’s instructor in philosophy and theurgy, Maximus, was accused in 364 of causing a lengthy illness in the new emperors Valentinian and Valens, but was acquitted due to lack of evidence. However, in 365-366 he was again arrested for illegitimate enrichment. A heavy fine was imposed and he was tortured because he was not able to pay. Around 370, his name was implicated in some rumours about an oracle on who the next emperor would be. Valens reacted unleashing a massacre, and thus made himself detestable to his subjects. Maximus was tortured and beheaded in 372 although, according to Eunapius, he had no involvement in this plot. Another case of a “miraculous” metamorphosis was Theodosius. His policy of tolerance in the beginning of his reign (379–395) gave way to bigotry. 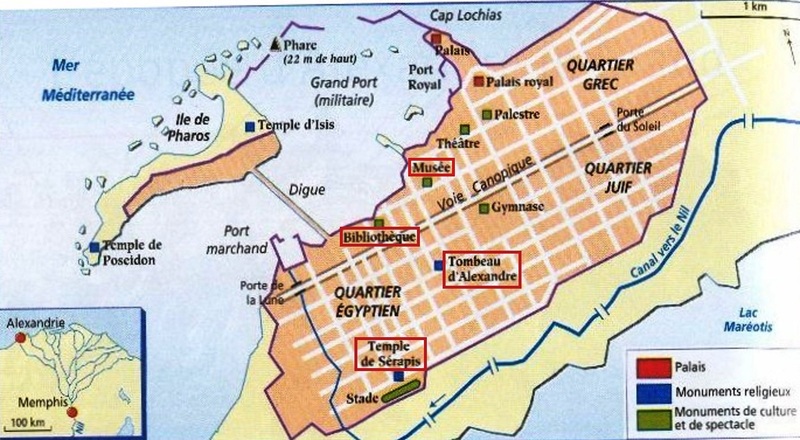 The turning point was probably the order to his troops to commit the abominable massacre of Thessalonica in 390, slaughtering at least 7,000 citizens in the Hippodrome, after they had rebelled against his Germanic mercenary garrison (see Chronicle 3). Ambrose, the archbishop of Milan, was quick to capitalize on this opportunity: he excommunicated Theodosius and thereby turned him into his obedient instrument. The emperor submitted himself completely to the Church and agreed to do public penance, promising to adopt a new role as the champion of the Christian faith. The result was the so-called “Theodosian decrees”, breaking up pagan institutions and destroying their temples. The first act of his “penance” was perhaps the ruination of the Temple of Apollo and most of the statues and works of art in Delphi in the name of Christianism in the same year (390). (b) The sacred site was completely destroyed by Christian zealots in an attempt to obliterate all traces of paganism, which was already proscribed, a “religio illicit”: gentiles would be sought out by Christian informers, brought to court and in many cases executed. This “war on the infidels” was transferred to Alexandria the next year. οὐ παγὰν λαλέουσαν, ἀπέσβετο καὶ λάλον ὕδωρ. Tell the emperor, the splendid hall fell to the ground. nor the speaking spring; the speaking water evaporated as well. The destruction of the Serapeum was seen by many authors as representative of the triumph of Christianism over other religions (or the victory of a Jewish god over Hellenic, Roman, Egyptian, Persian, and other gods – hence other cultures); while that of the Library of Alexandria symbolized “knowledge and culture ruined”. 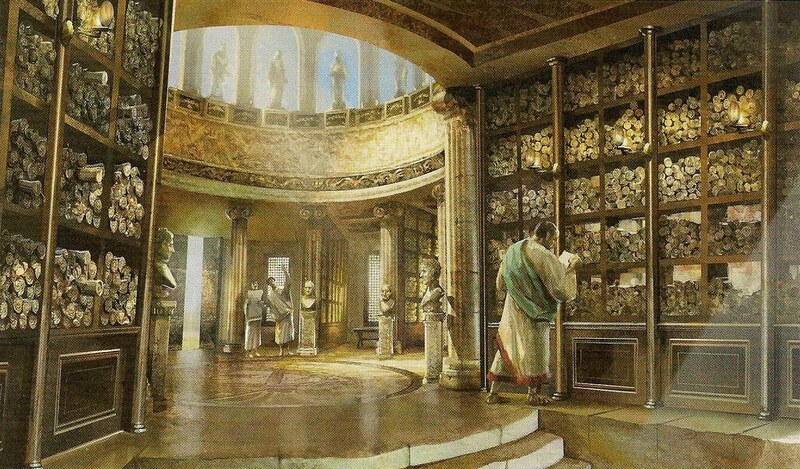 The library held over 700,000 documents from Hellas, Egypt, Assyria, Persia, India, and many other countries, being part of a larger research institute, an ancient university, called the Musaeum (House of the Muses), where many of the most famous thinkers of the ancient world studied and worked, such as: Archimedes, the greatest genius of antiquity; Ctesibius, the father of pneumatics and inventor of the hydraulis or water organ, the precursor of the pipe organ; Euclid, the father of geometry; Hipparchus, the father of astronomy and founder of trigonometry; Hero, a follower of the Atomists, the father of mechanics and inventor of the first steam engine (aeolipile); Eratosthenes, who argued for a spherical earth and calculated its circumference, as well as the tilt of its axis, to near-accuracy; Aristarchus, who proposed the first heliocentric system of the universe. His case is an excellent example: his only extant work, On sizes and distances of the Sun and the Moon, is based on the geocentric model. The other book, where he proposed the alternative hypothesis of heliocentrism, is known only through citations by other scientists, such as Archimedes. Is this just a coincidence? Absolutely not! In Cyprus, “saint” Epiphanius, the bishop of Salamis, christianized gentiles en masse with the threat of slaughter and fire, destroying all sanctuaries. In 392, Theodosius banned the mysteries of Aphrodite. The next year, the emperor extended the ban to all Pan-Hellenic artistic and athletic festivals and games, such as the Olympian, Pythian and Isthmian, as well as the Roman Actia. Given the opportunity, the sanctuaries in Olympia were plundered. In 395, Christian atrocities spread all over Greece, including sites that were symbols – not only Olympia, but also Dion, Delphi (again), and Eleusis, where the ancient sanctuary was set to fire and all the priests were killed because they had tried to revive the Eleusinian Mysteries. In this atmosphere of chaos and polarization, utmost decay and moral degradation, proclaimed as “the triumph of Christianity against idolatry”, the symbolism of a “Victorious Jesus” could in no way be overwhelming without the ‘defeat’ and ‘conquest’ of the invincible conqueror Alexander. The great king had died (probably poisoned) in Babylon in 323 BCE. His body was en route to Macedonia when it was hijacked by Ptolemy Soter for the prestige of having Alexander’s tomb in Egypt. The deceased, who had been declared “the son of Amun” by the god’s oracle at Siwa Oasis, asked shortly before his death to be buried there, in the temple of Zeus Amun, rather than alongside his actual father, Philip, at Aegae. Ptolemy Philopator built a magnificent mausoleum in Alexandria, inside a huge sacred precinct, known as Soma (Body), which became one of the most famous and sacred sanctuaries of the ancient world, for Alexander was worshiped as a god in the Macedonian and the Roman Empires – especially in the city he had founded, where he was like a patron. A large number of rulers and politicians, officers and officials, both Hellenes and Romans, paid their respects to Alexander visiting the mausoleum. Julius Caesar was the first Roman leader to go to the Soma, as a pilgrimage to the grave of his hero. Many others followed, from Augustus to Severus. However, the tomb was also looted by villains like Caligula, who removed the breastplate, and Caracalla, who took the tunic, ring, and belt in 215, while his troops were looting Alexandria for several days, slaughtering over 20,000 citizens, mainly young people, because of a satire produced in the city mocking his claims that he had killed his brother and co-emperor Geta in self-defense. George Sandys, who visited Alexandria in 1611, was shown a sepulchre there, venerated as Alexander’s resting place. Whatever the fate of the tomb that was “mysteriously” lost again, these testimonies constitute a double defeat on Christianism: a) Alexander’s veneration continued either with or even without his body, despite its desecration; b) a comparison between the two monotheistic religions on this issue ends up overwhelmingly against Christianism. Since 1811 this mummy rests in a crypt under the altar of the church inside a marble sarcophagus on which there are also several Macedonian symbols. Copts, on the contrary, believe that Mark’s head remains in a church named after him in Alexandria, parts of his relics are in St Mark’s Cairo Cathedral, and the rest are in Venice. Nevertheless, there is one “little” detail: early Christian writers such as Dorotheus, Eutychius, and the author of the Chronicón Paschale say that Mark’s body was burned by the pagans… A scientific study on these remains would reveal the secret of their origin. Radiocarbon dating would establish whether the body is old enough to match to that of Alexander. Likewise, it would be possible to reconstruct his facial features from the skull (wherever it is), and inspect the bones for signs of multiple injuries, particularly the one inflicted on Alexander’s chest when an arrow penetrated into his sternum… Do you really think there will be any Church officials who would ever allow such a study, putting at risk the Church’s history for History’s sake? The Great Terror in Alexandria culminated in 415 with the brutal murder of the great philosopher, mathematician and astronomer Hypatia, “a most beautiful, most vertuous, most learned, and every way accomplish’d Lady; who was torn to pieces by the Clergy of Alexandria, to gratify the pride, emulation, and cruelty of their Archbishop, commonly, but undeservedly, stil’d St. Cyril”, according to the philosopher John Toland. The astronomer Carl Sagan linked Hypatia’s death with the demise of the celebrated library. The assassination, symbolizing the end of Alexandria as a centre of wisdom and scholarship, was instigated by Theophilus’ nephew and successor, Cyril, the so-called “pillar of faith”, proclaimed as a “doctor of the Church”, and also canonized as a… “saint” (of all Christian denominations, while his uncle has been treated as a “saint” only by the Copts). Emperor Theodosius II, instead, described Cyril as a “proud Pharaoh”. Of course, nothing was left from Hypatia’s writings. The Parthenon was plundered in 429, accompanied by a widespread persecution of the Hellenes who were considered demon followers. The temple of Athena survived for nearly one thousand years until Theodosius II decreed in 435 that all ancient temples throughout the Empire be closed. In the last decade of the sixth century it was converted into a church of Virgin Mary. 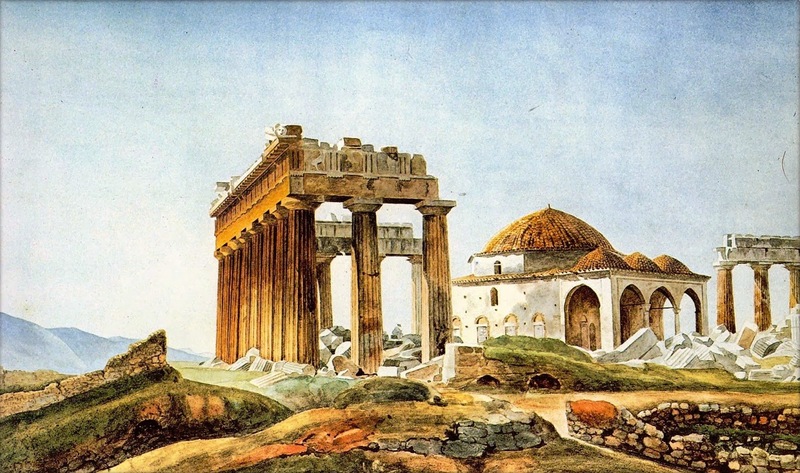 Parthenon, disguised as “Parthenos” (“Virgin”), became the fourth most important Christian pilgrimage destination in Byzantium after Constantinople, Ephesus, and Thessalonica. In 529, a date often cited as the end of Antiquity, Justinian decided to shut down the Platonic Academy that had been revived in 410 as a centre for Neoplatonism and mysticism. The old Academy was probably destroyed by the Roman dictator Sulla in 86 BCE. According to the Greek poet and historian Agathias, the faculty members looked for protection under the Sassanid king Khosrow (Khosrau) I (531-579), known to the Hellenes and Romans as Chosroes, in his capital at Ctesiphon, carrying with them precious scrolls of literature, philosophy, and science. 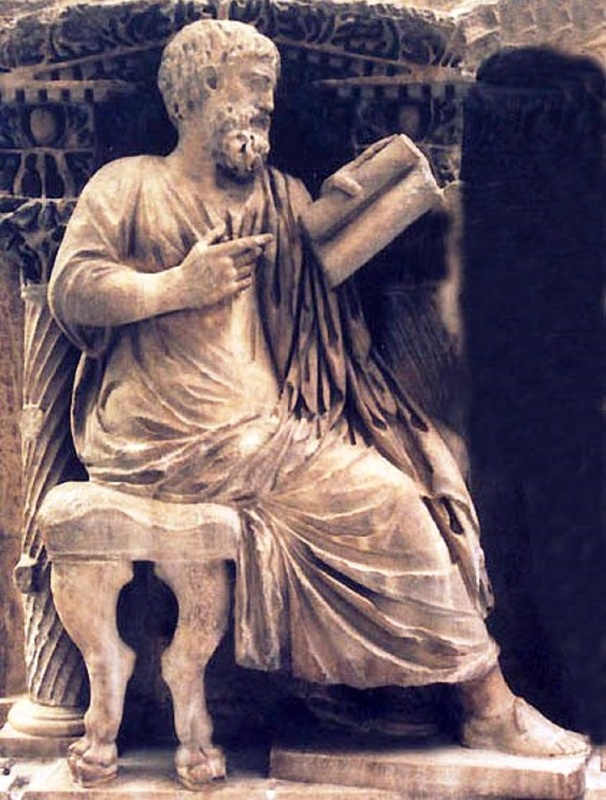 After his exile, Simplicius of Cilicia (and perhaps some others) may have gone to Harran (Carrhae or Hellenopolis), near Edessa, Upper Mesopotamia, founding an Academy-in-exile. The school must have survived into the 9th century, facilitating a revival of the Neoplatonist tradition in Baghdad, with the foundation of the House of Wisdom in 832. Two of the major centres of learning in the intervening period (5th to 8th centuries) were the School of Nisibis (Nusaybin, close to Harran) in Asia Minor, then under Persian rule, and the Academy of Gundishapur, founded by Khosrau. According to the Austrian philosopher and educator Rudolf Steiner, the culture of Gondishapur (also home of a medical school-hospital and a library) was a premature efflorescence which was – necessarily – destroyed by the Islamic troops in the 7th century (Parallel Lives of religions). The “brain drain” started in 489, when the Nestorian Christian theological and scientific centre in Edessa was ordered closed by the emperor Zeno, and was transferred and absorbed into the School of Nisibis. Its scholars, together with Hellenistic philosophers banished from the Academy of Athens, carried out in this school important research in medicine, astronomy, and mathematics. The Academy of Gondeshapur became known for medicine and learning. Khosrau gave refuge to various Greek philosophers and Syriac-speaking Nestorian Christians fleeing religious persecution by the Byzantines, and commissioned the refugees to translate Hellenic and Syriac texts (on medicine, astronomy, philosophy, and useful crafts) into Pahlavi (Middle Persian). Conclusion: while the Hellenes were being barbarized, the “barbarians” were being “Hellenized”! The Crusades were conducted under the sanction of the “Holy See” after the East – West Schism. Pope Urban II proclaimed the First Crusade in 1095 with the declared goal of restoring Christian access to the Jerusalem area. There followed six major Crusades against Muslim territories in the East and many minor ones as part of a 200-year struggle for control of the “Holy Land” that finally failed. After the fall of the last Christian stronghold in 1291, the Vatican mounted no further coherent response in the East. Many historians give equal importance to comparable, Papal-blessed military campaigns against “pagans”, “heretics”, and “excommunicated” people, undertaken for a variety of economic, political, and religious reasons, such as the Albigensian Crusade, the Aragonese Crusade, the Northern Crusades, and the Iberian Reconquista. The “burning of books and heretics or infidels” was, of course, in the agenda of all Crusades. The conduct of the Crusaders was shocking not only to modern sensibilities but to European contemporaries, as well, for the Crusaders pillaged the countries they passed through and there was at least one case of cannibalism in the Levant! In the Rhineland the First Crusade resulted in the massacre of 8,000 Jews in the first of Europe’s pogroms. It also resulted in the slaughter of 70,000 citizens in the fall of Jerusalem. The nobles carved up the territory that they had gained rather than return it to the Byzantines, as they had vowed to do. Even worse, the Fourth Crusade resulted in the conquest and sacking of Constantinople, and the partition of the Byzantine Empire. Nalanda, an ancient centre of higher learning with a great library in Bihar, India, was sacked by Turkic Muslim invaders from today’s southern Afghanistan in 1193. The university was so vast that it is reported to have burned for three months after the invaders set it on fire. The House of Wisdom was a library, translation institute and research centre in Abbasid-era Baghdad. The scholars, primarily Persians and Greeks, translated all available Hellenic texts – scientific, philosophic, and many more. Note that a great part of ancient Greek literature survived and became known to Europe thanks to these translations into Arabic. The House and all other libraries in the city were destroyed by the pro-Christian Mongol ruler Hulagu in 1258. They say that the waters of the Tigris ran black for six months with ink from the enormous quantities of books flung into the river! Pope Nicholas V may have tried to revive the spirit of the old Crusades in the East in 1452, one year before the Fall of Constantinople to the Ottomans, as his nephew, Loukas Notaras, was the Byzantine Megas Doux (Grand Duke). However, the Europeans’ attention was already focused on the more promising opportunities opening up in the West. Thus, Nicholas’ papal bull, renewed repeatedly by future Pontiffs, granted Portugal (and later Spain) “full and free permission to invade, search out, capture, and subjugate the Saracens and pagans and any other unbelievers and enemies of Christ wherever they may be, as well as their kingdoms… and other property… and to reduce their persons into perpetual slavery.” Effectively, these “geographically unlimited” bulls extended the Crusades’ legacy all over the world justifying European colonialism and, at the same time, “ushered in the West African slave trade”. This trade was about to take off very soon with the transport of African slaves to America, and the Vatican would continue “granting permissions” to guarantee its share. During the 15th century, Arabic Muslim books were burned wholesale by Catholic Spain. About 5,000 Arabic poetic manuscripts were consumed by flames in the public square at Granada in 1499 on the orders of the Archbishop of Toledo. At the same time a number of Hebrew Bibles and other Jewish books were burned at the behest of the Spanish Inquisition. What conclusions can we draw? An naïve person would expect to find the first traces of the idea of human rights in religions, especially the monotheistic ones, which should uphold the sanctity of human existence. In reality, the history of human rights finds traces of them in some legal codes of antiquity (Mesopotamia, Persia, India, Hellas, Rome), but not in the Bible, skipping Judaism and Christianism. The reason is that the ones who cared about such rights were the philosophers and not the prophets (with the exception of Muhammad who was obliged to deal with the subject). The kings who wanted to conquer the world, and the priests who wanted to conquer the mind, infringed as a rule on human rights. I think that if the Declaration of Human Rights and freedom of religion had been adopted and observed in the beginning of the Common Era (AD), the only monotheists in the world today might be the Jews!